Plenty of stylish boutique hotels make vague gestures in the direction of rustic idioms, but few trade in contrasts so vivid as those on offer at the Reserva do Ibitipoca. A little over a hundred miles inland, due north of Rio, is the Ibitipoca State Park, a region that’s known for its stunning mountain vistas. 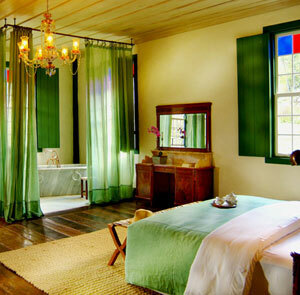 Adjoining the state park is the Reserva, some 7,000 acres of abandoned farmland that’s been converted into a nature reserve, and it’s here, among the old farm houses, that you’ll find some of Brazil’s most distinctive lodgings. 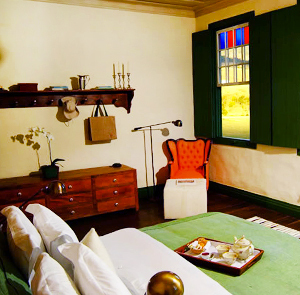 The bulk of the accommodations are in Engenho’s Farm, a meticulously restored eighteenth-century farmhouse that now serves as the Reserva’s main lodge. The eight suites are antique in most of their particulars, but feel art-directed rather than simply preserved, assembled by a designer with a contemporary eye, however old-fashioned the raw materials may be. The weathered hardwood floors, for example, feature radiant underfloor heating. It’s in and around the lodge that you’ll find everything from the spa to the airstrip to the restaurant and the stables with their famous fleet of horses. Two more secluded houses lie farther afield, both equally rustic (though powered by solar energy). There’s no TV anywhere, in what these days is practically a political gesture. Instead you’re meant to engage with your surroundings, via horseback or on foot — with expert guides, in the midst of one of Brazil’s most remarkable landscapes, most of us will need little encouragement to get outside. 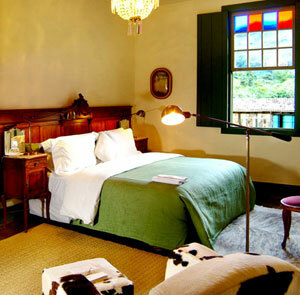 Reserva do Ibitipoca is located 1h30 from juiz de fora and 3h30 from Rio de Janeiro. Transfers can be arranged from Francisco Alvares de Assis Airport (Juiz de Fora) for BRL240 each way. Please contact CustomerService@TabletHotels.com for assistance with airport transfers.